For those who use any of the Davines shampoos, you may be wondering why there are not tons of bubbles filling your shower when you wash your hair? There is actually a really interesting story behind that! For starters, all of Davines’ products are sulfate free; the chemical used to create foamy bubbles for lathering in most shampoos. So the story behind bubbles. Where did they come from and why are they in our shampoos? During The Great Depression, shampoo companies added bubbles to shampoo because bubbles make people happy. What they added was a bubbly cleanser commonly known as sulfates. Yep! That’s the real story! While sulfates as hair cleansers are not inherently bad, over time they can lead to a dehydrated scalp from over cleansing. They will also strip out your hair color. Cosmetic chemists were not worried about those things in the 1930’s because people weren’t washing their hair as often, and artificial hair color wasn’t as common. Davines products are sulfate free! They are color safe and won’t dehydrate the scalp with over cleansing. You may notice they still lather. Davines uses a different cleanser so you still get the foam experience without the harsh sulfates. The dirtier your hair, the less lather you will experience because the little bubbles are busy carrying dirt away from the hair. Miss the lather? Do a second shampoo and you will have plenty of bubbles to enjoy. 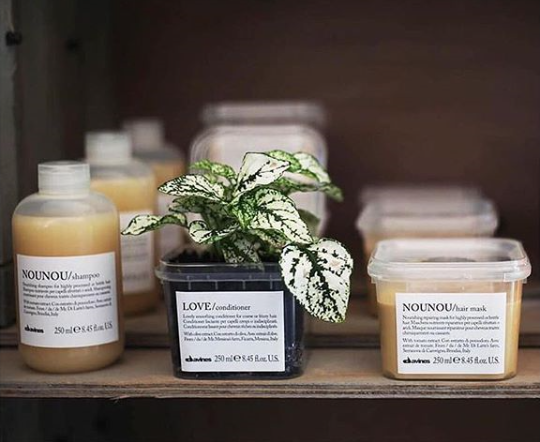 Have more questions about Davines products? Ask your stylist next time you are in!